Whilst watching the predictable looking match between sister’s Serena and Venus Williams from Wimbledon and trying to fill the gaps doing something ‘useful’ on the web, I came across this article on the Indian Chathurangam website. World Champion Viswanathan Anand might have been a Tennis player depriving India of its first Grandmaster, but for the alarm clock. He also attended a coaching camp for the game in his childhood. "They wanted me to wake up at 5-30 am every day and jog, so I gave up the game," he said. "Had I not become a Chess player, I would have loved to be in Fine Arts or Information Technology - in which one can sit alone and work his brains," he said. Asked how he felt at being one of the eminent personalities of the country, Anand said simply, 'I enjoy it'. 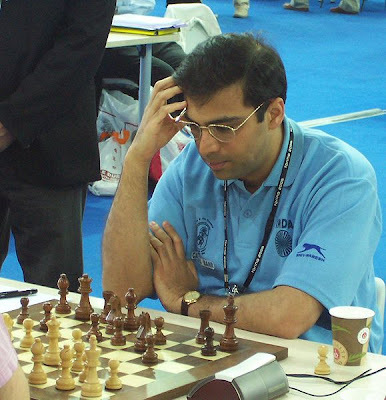 Revealing how he concentrated during a gruelling game, Anand said "I do a lot of preparation before a game. So, I know the first 10 or 15 moves. Of course in critical moments one really has to push oneself and that is very challenging". The Champion candidly confessed that he hated losing to rivals he did not like. "It really hurts then". He could, however, reconcile himself to defeat if the writing on the wall became clear to him within half an hour even if the game dragged on for hours. He felt that a sound sleep before the game increased concentration. What made a true sportsperson? The Grandmaster said "Probably, the desire to compete and play in a healthy way to bring out the best in oneself". Asked to spell out his initial feeling on winning the World Championship, Anand said "Confusion. Suddenly everybody rushed to the stage. It took half an hour for the feeling to sink in". Chased by autograph hunters, whose autograph would he wish to take? the question came from a young lady. "Any pretty woman, of course," he said with a glance at wife Aruna, as the packed auditorium burst into laughter. Aruna, who enjoyed the interaction, proved equally good at fielding questions. "How difficult is Anand as a husband?" "He is very simple and down to earth," she replied.